In an earlier post, I explored the origins of London’s catacombs and one group in particular: those at Kensal Green Cemetery. In November last year, as a favour for a talk I gave at West Norwood, I was guided around the catacombs in this South London Cemetery. Catacombs are underground structures, built of brick or stone in the form of a cellar, which house coffins in recesses in galleries. Altogether, ten cemeteries in nineteenth-century London were constructed with catacombs: those at West Norwood being installed in 1840. The word ‘catacomb’ literally means ‘among the tombs’ and the latter clearly expresses why these spaces are so different from conventional burial sites. 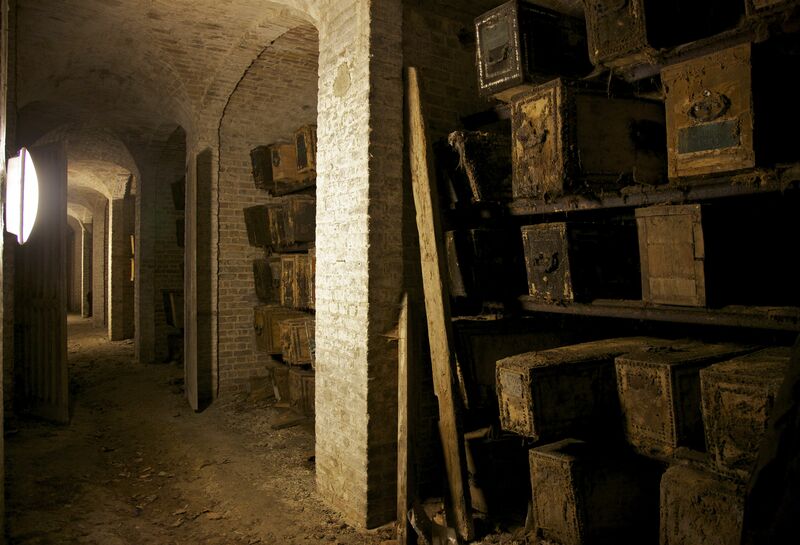 In a catacomb the dead are directly accessible: at West Norwood, coffins line the recesses along the brick tunnels (1), many now in an advanced state of decay. In former times, relatives of the deceased would visit these spaces and commune with their loved ones with a sense of intimacy not possible with a conventional grave. 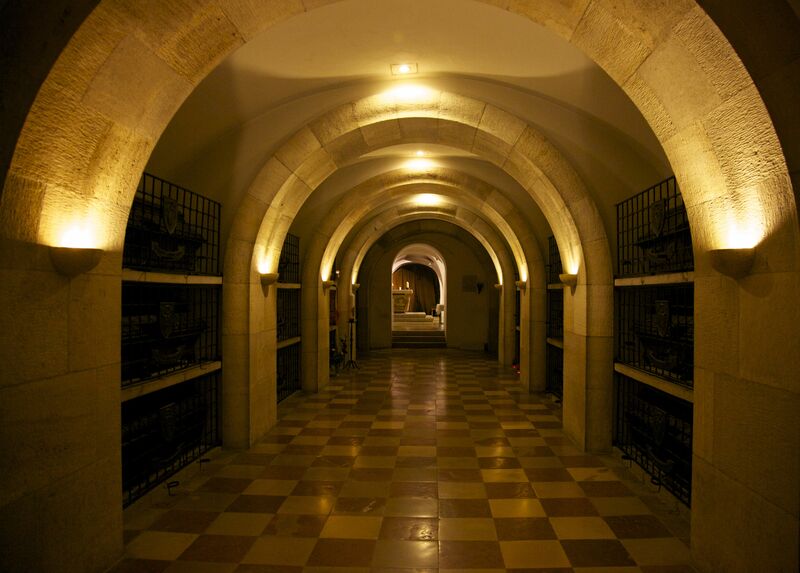 Catacombs are spaces where one can literally be among the dead, temporarily sealed off from the life above ground in a private and exclusive space. Yet, as with all cemeteries, there is also a community of the dead here; unless one is important enough to have an isolated mausoleum, places of rest are invariably shared. Certainly, catacombs are no place to be alone; when my guide took me into a tiny, pitch-dark recess filled with the tiny coffins of children, I felt a powerful sense of horror at being almost consumed by the dead, shuddering at the thought of such overwhelming losses. Despite their communality, the catacombs at West Norwood, just like their counterparts in other London cemeteries, nevertheless express the desire for continued social distinction after death. 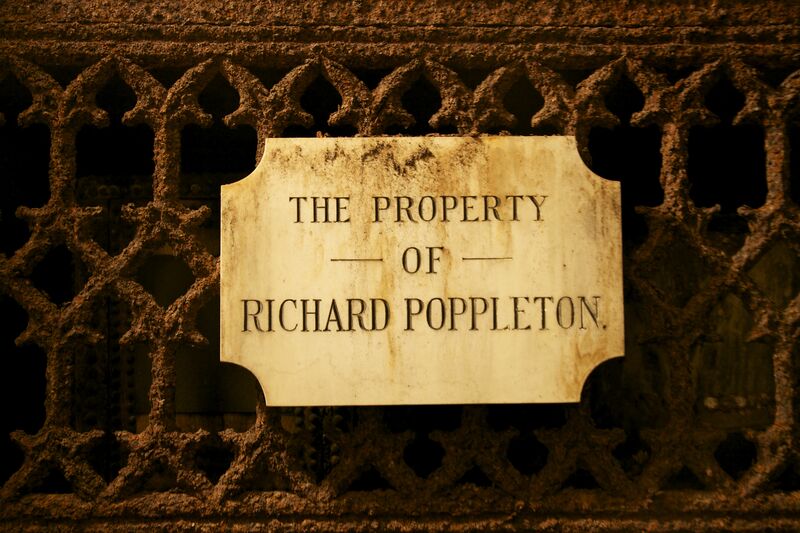 Purchasing a catacomb was a sign of high social (and financial) standing, the signs of which are most clearly expressed in the plaques that mark the individual spaces (2), a forlorn grave-digger’s spade the only reminder of the social ‘other’ that always haunts such a desire for exclusivity (3). In even more exclusive catacombs, like those beneath St Stephen’s Cathedral in Vienna (4), this desire for social distinction generated both horror and absurdity. Once the burial site of nobles, in the eighteenth century these spaces became the general catacomb for all of Vienna’s residents. 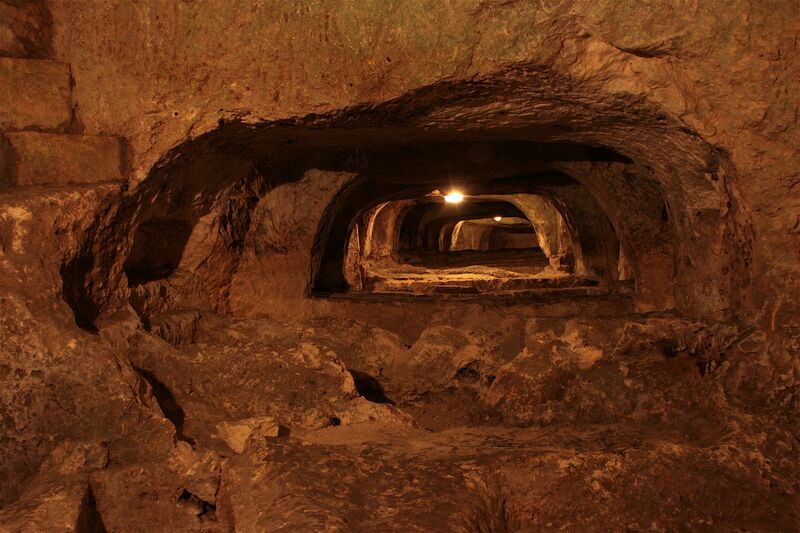 During the time of the Habsburg Empire, the catacombs were once again transformed into an exclusive space – a pristine stone-arched vault – while the rest of the bones were moved to an ignominious pit. Today, in these catacombs, the pickled organs of the former Habsburg rulers are preserved in copper urns, their mummified bodies preserved in two other sites in Vienna. It is as if this level of social distinction has literally torn apart the bodies, one burial site being inadequate to preserve the idea of an eternal kingdom. Yet, in their early incarnations, catacombs were once spaces of inclusivity. 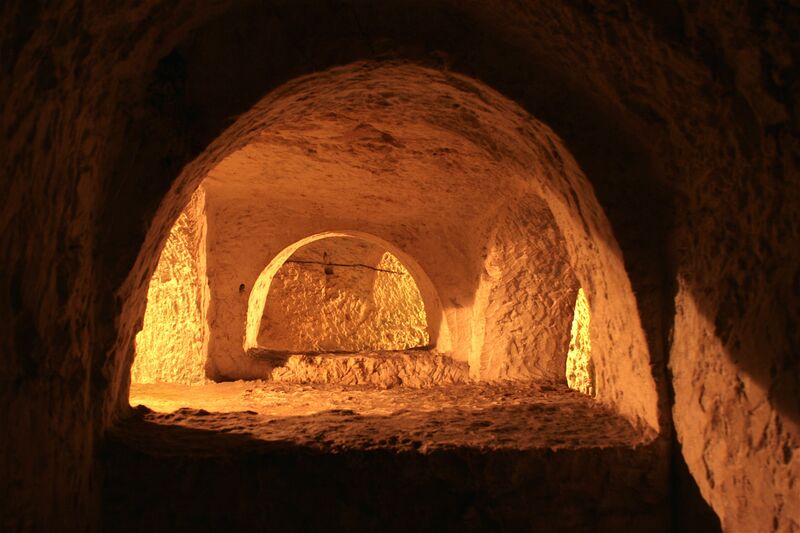 The island of Malta is riddled with ancient underground spaces, including the St. Paul’s catacombs, outside the former Greek city of Melite (now Mdina). In a series of deep rectangular shafts flanked by chambers (5), one can still see the evidence of Christian, Pagan and Jewish burials. Originating in pre-Roman Phoenician culture, these spaces were taken over by the successive religious groups that lived side-by-side in Malta over the centuries. 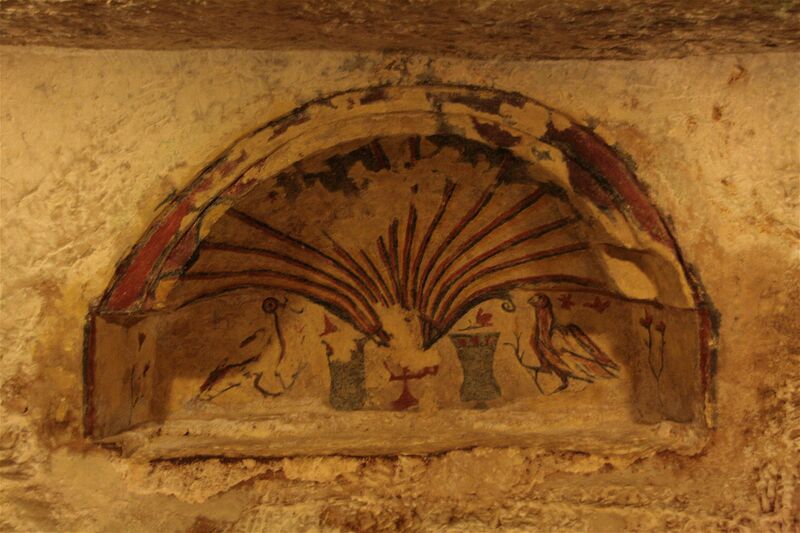 In these catacombs, Jewish mourners might perform ritualised acts of memorialisation next to Pagan rites of sacrifice, while a faded Christian wall painting displays the same act embodied in another form (6). Walking and crouching in these spaces, their womb-like enclosures and soft, warmly-lit walls (7) seem to speak of the possibility of social unity rather than heightened division, where together we can face the inevitable erasure of distinction that will come to us all. Opened in 1837 they include a group of 95 vaults with private and shared loculi (coffin spaces) with a capacity of 3500 coffins. The Anglican and Dissenters’ chapels above the catacombs suffered bomb damage during World War II and were subsequently demolished. No coffins have been interred since the 1930s. Some were moved at relatives’ requests; however most remain untouched. The catacombs are laid out in six narrow vaulted passages, either side of the main vault, each with seven bays. Some bays contain gated vaults or are individual loculi with either cast-iron gates or stone memorial tablets, others were left open. Also visible are the remains of funeral tributes or ‘immortals’. At the end of each of the vaulted passages there is an open grating designed to allow air flow through the catacombs. In the middle of the central area is a hydraulic catafalque (coffin lift) designed by Bramah & Robinson dated 1839. 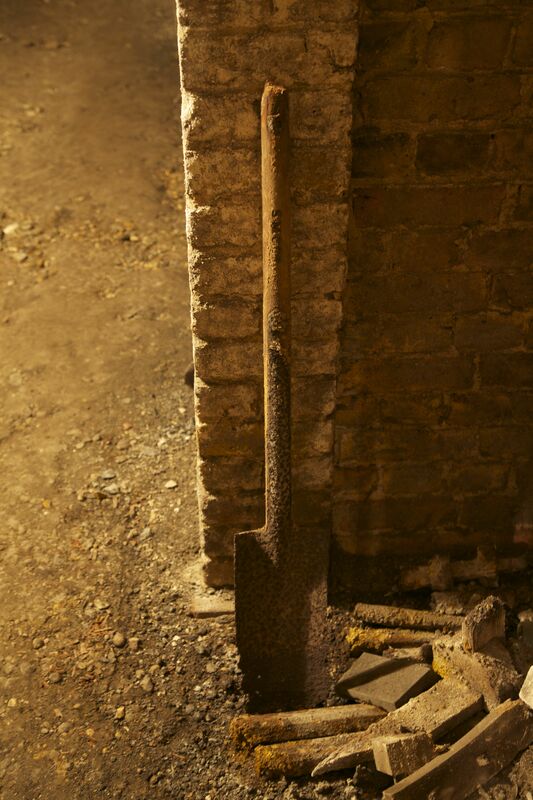 This was used to transfer coffins into the catacombs from the chapel above. 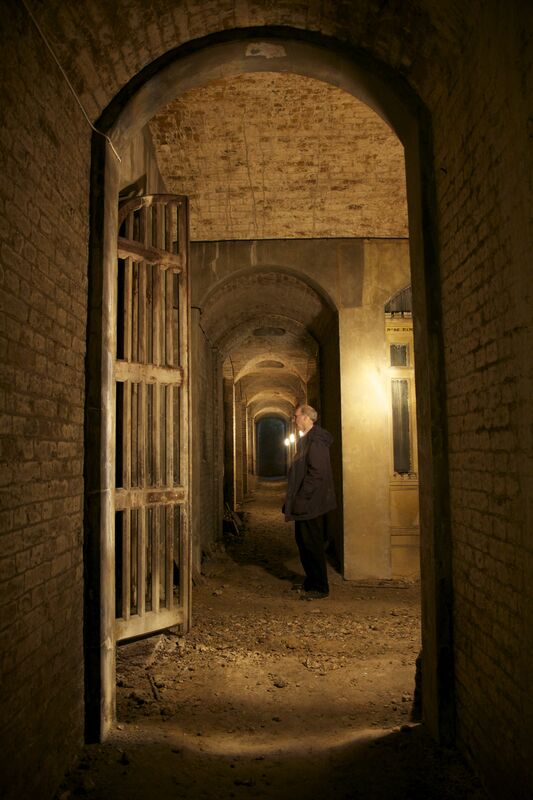 Our contribution to London Open House Weekend is now rather less spectacular than it used to be, with the catacombs closed, and we decided therefore to take part on only one day, Sunday 23 September. We provided a series of tours of the most notable monuments during the afternoon, with access to the Greek chapel (which, incidentally, is in a severely deteriorating state inside, with much rain damage to ceilings, etc). Considering the limited special attractions, and dull damp weather, the fact that around 75 visitors turned up in the space of a couple of hours was deemed a success. Of particular note were the family from Rutland who had made a day trip to London specifically to visit as many as possible of the Open House venues in Lambeth (yes, really!). Thank-you! Your summer photos of Snowdonia are fabulous. I’m going to post soon on the Rhinogs, where I spent 3 weekends over the summer. Glorious! Thanks! I’ll look forward to seeing your post on the Rhinogs – a place I haven’t been to yet.